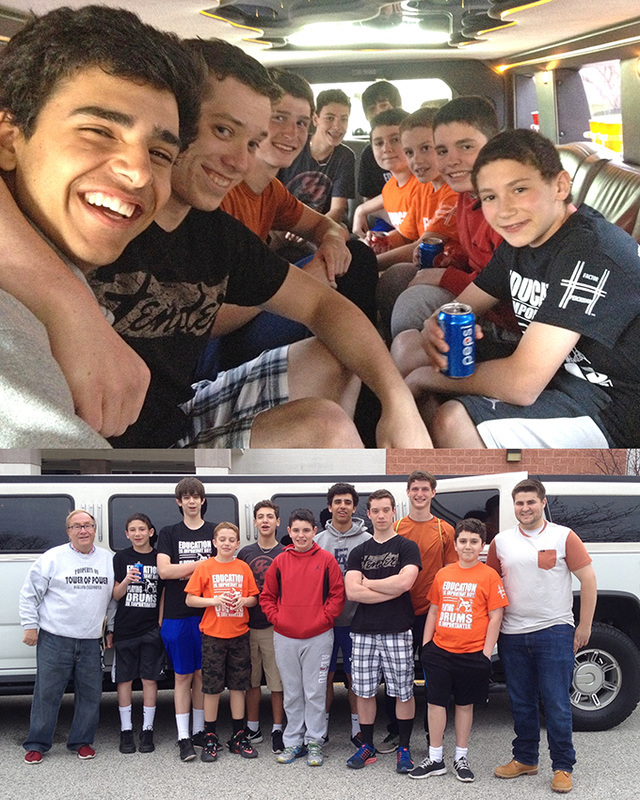 Above, is a group of students from 2012, on their way to see Tower of Power; Below, is a 2015 group, headed for a Keswick Tower of Power show in a HumVee Limo! 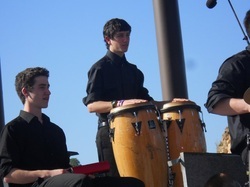 Chris, from Villanova, playing with Radnor High School Jazz band: I've been with Mr. H for 5 years. He is the reason I love the instrument and is always willing to go the extra mile. 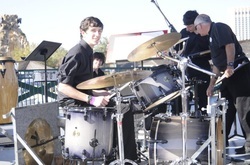 . .
Lauren R, from Merion: An adult drum student: Mr. H is unparalleled in his enthusiasm, patience, & encouragement. My boys and I love how he has made drumming a part of our lives. Matt F, from Bryn Mawr, goes to Episcopal Academy: The four best aspects of Mr. H are humor, talent, knowledge and kindness. He knows everything about percussion. 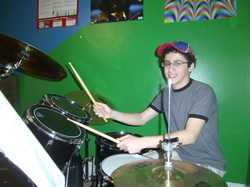 Jack D, from Wayne, goes to Radnor High: Mr. H makes me "Feel the Beat"! Allan and students from Radnor High School at AMA Bronze tour Europe trip. 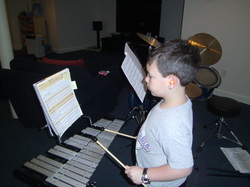 Eli, from Bala Cynwyd, one of our younger students, here playing orchestra bells. 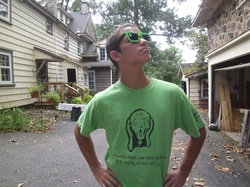 Mike M, from Rosemont, goes to Radnor High School. Mike M from Rosemont, playing at an outdoor concert. 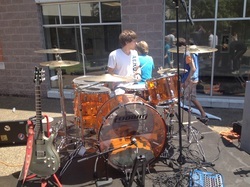 Chris, from Haverford playing modern rock music on full drum kit. Matt H, from Malvern, goes to high school at Great Valley. Brady P, from Wayne, goes to Radnor High School. Jack L, from Villanova, went to Radnor High, now attending Hobart University. Elias G, from Merion Station, goes to Bala Cynwyd Middle School. Zach Z, from Berwyn, goes to Episcopal. Zach Z, from Berwyn is in 9th grade at Episcopal now. He's been going strong with H Factor for over five years! Eddie W, from Bala Cynwyd, of Bala Cynwyd Middle School, here playing bells. Danny R, from Narberth, goes to Lower Merion High School. Seth M, from Havertown, started with Mr H when he went to Manoa Elementary. Seth M, from Havertown, now goes to Haverford Middle School. Alex M, from Glen Mills, goes to Episcopal: Mr. H is a great teacher. He is funny, very kind and treats all of the kids with respect. 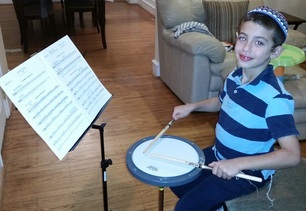 Reed B, from Bala Cynwyd, is a beginner student, learning on a drum pad. Adam G, from Penn Valley, was at Welsh Valley Middle School when he started with H Factor. 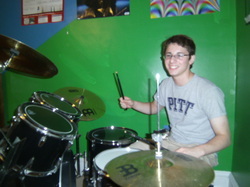 Adam G, from Penn Valley, now goes to Harriton HS, and he's still feeling the beat! Tyler W, from Villanova, goes to Haverford School for Boys: Mr H's passion is contagious and spreads to anybody around him while also giving an amazing experience. . .
Charlie H, from Narberth, goes to Belmont Hills Elementary. 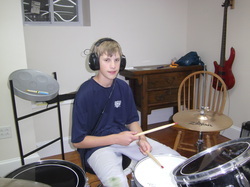 Jimmy L, from Newtown Square, plays for the drumline at Episcopal Academy. 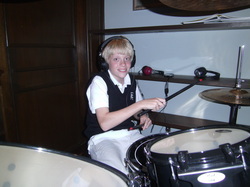 Henry S, from Berwyn, is on the school band at Episcopal Academy. Erica B, from Wynnewood, goes to St. Margaret's Elementary School. She's looking forward to being the only girl drummer in the school band. 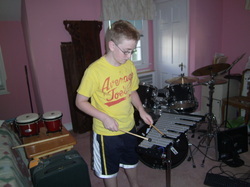 Aidan C, from Valley Forge, feeling the beat! Sean M is a fifth-grader now. One of our H-Factor brother combos! 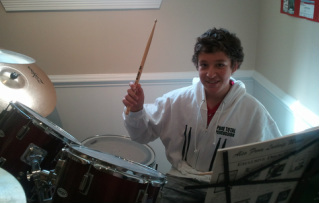 Ethan G has graduated to Radnor Middle School now, and his drum skills keep improving! Liam G, from Narberth, is a fourth grader at Belmont Hills. 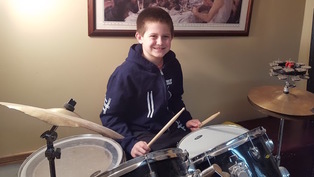 Liam G, from Narberth, is in 6th grade at WVMS, now, but he's still rocking with H Factor. Dan M, from Overbrook Park, one of our adult students. Tommy B, from Wynnewood, is a 7th grader at Bala Cynwyd Middle School. 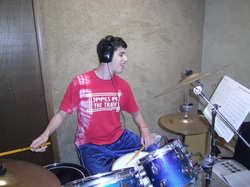 Tommy B, from Wynnewood, is a 9th grader at LMHS, now, but still feeling the beat! 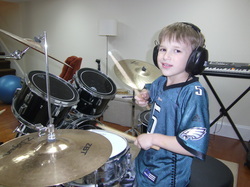 Lucas C, from Penn Valley, shows that 5-year-olds can rock! Bobby D is from Malvern. Allan also taught his son. Deirdre M from Merion Station, knows how to jam. Liam G from Wayne, is in second grade now, and still rocking at VFE! 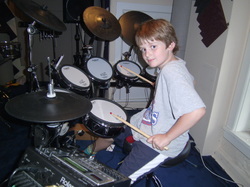 Ezra S from Merion is in 4th grade at Merion Elementary now, and he's still "feeling the beat"! George C is in the second grade at Episcopal now. Check him out on the full drum kit. Josh J is now a second grader at Valley Forge Elementary. 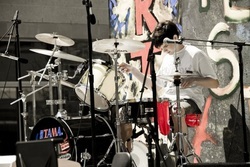 he's anotehr student that moved from drum pad to drum kit! Susan T, from Springfield is one of our adult students who knows how to rock the house! Hall R, from Radnor Middle School is a seventh grader who just joined the H Factor "army"! 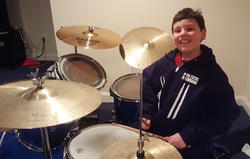 Hall R, from Radnor Middle School has retired the drum pad and plays a full kit, now. 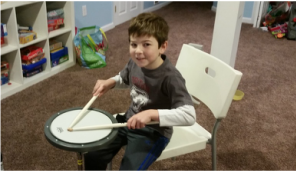 Max R, from Ithan Elementary didn't want his big brother to have all the fun, so he's taking drum lessons from H Factor now, too! 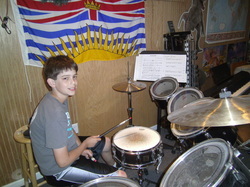 Max R, from Ithan Elementary, is in the fifth grade now, and jamming on the full drum kit. 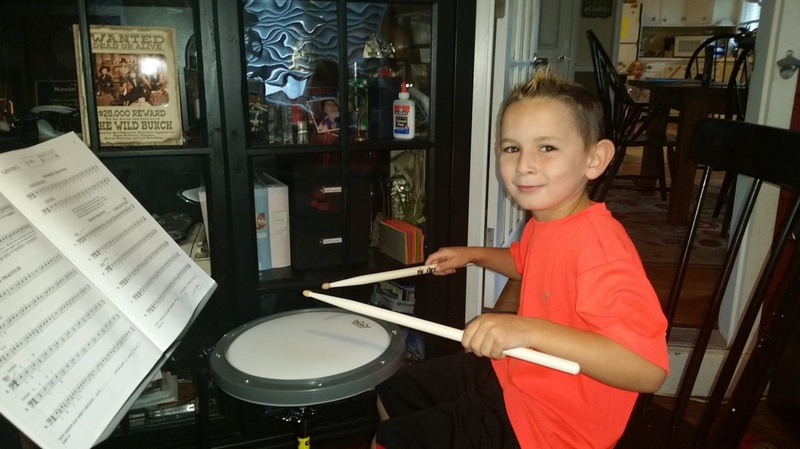 Ben H, from Wayne Elementary already has a drum kit. 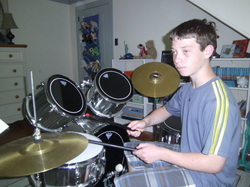 He'll be the head of his 5th grade class this year - feeling the beat for the school band. 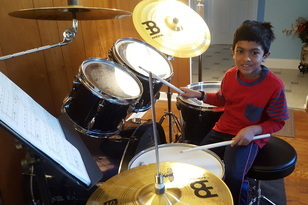 Binny P, a fourth grader from Bala Cynwyd is a left-handed drummer who nows feels the beat with the H Factor army. Walker S, a junior at Lower Merion HS is one of our new teenage students. Jude F from Narberth has a sister who's been taking lessons with Mr. H for a while now. Jude is now an H Factor student, too. 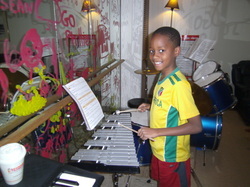 James B, from Penn Valley, is a 4th grader, just starting drum lessons. 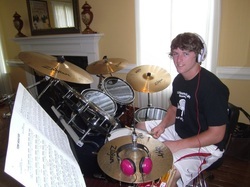 Today, he starts with a drum pad - tomorrow, who knows where this young guy can go! 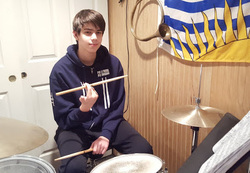 Alex P, from Radnor Middle School, is a 7th grader taking his skills to the next level! Payton E, from Gladwyne Elementary, is a first grader with some serious potential! Matt B, from Cynwyd Elementary, is in third grade, but learning fast. Luke H, from Radnor Middle School, is in sixth grade. He plays a mean drum when his Spider-senses are tingling! 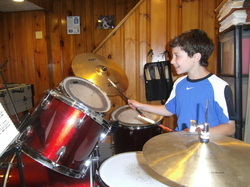 Lucas knows that Main Line kids who want drum lessons go to Mr. H at H Factor Percussion. Kaia, from Penn Valley Elementary is an eight-year-old with some great promise! West Chester, proves that you don't have be be a little kid to start as an H Factor student! 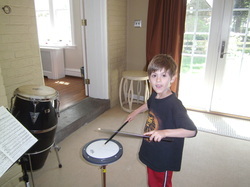 Gus K from Havertown, is a second grader taking his first drum lesson with H Factor Percussion. James S is a 3rd grader at Chatham Park Elementary. He's the newest H Factor percussion student. Micah M, a 3rd grader at Manoa Elementary, has joined the H Factor ranks with his two brothers! Danny is in ninth grade at Delaware Valley Friends School. He and his father, Dan, are both H Factor students now! Gus T is a 7th grader at Bala Cynwyd Middle School. Hard work earned him a spot on the Junior Jazz Band! He's the newest drum student at H factor Percussion. Yair S, from Merion, is in Kindergarten. 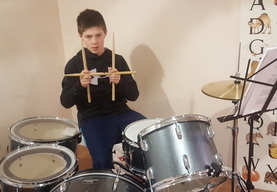 He's been watching his brother learn the drums, and now it's his turn! Sameer K, from Newtown Square, is a 7th grader at Episcopal Academy. This drum pad is just step one to a very promising drumming future! Jake R, from Narberth, played this drum solo for his second grade class at Merion Elementary. Jake R, from Narberth, four years later, played this with the BCMS junior jazz band. 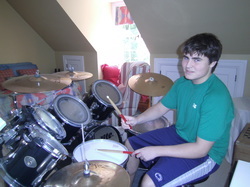 Matt C, from Radnor: I've had Mr. H for 8 years and he has taught me everything I know on drums. 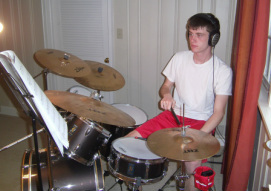 He encourages music like no other and makes every lesson a super fun and jammin' time. 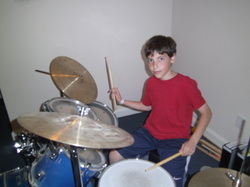 Will S, from Penn Wynne: I started taking lessons four years ago, at age 54. Allan could not have made it easier for me to master the drum kit. His support has made me comfortable playing at open mic nights each week - different music with different musicians. I couldn't be happier. Will S, jamming at a club. 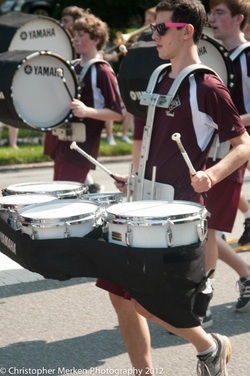 Ben L, from Berwyn, goes to Conestoga High School: From the basics of percussion, to jazz, to marching band. . . Mr. H is able to cover it all. 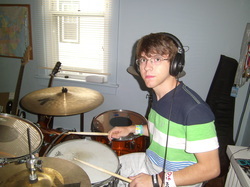 Daniel S, Merion Station, at Friends Central, here on electronic drums. 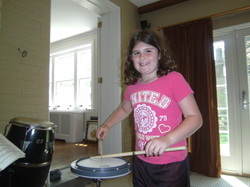 Ella B, from Bala Cynwyd, is a beginner student, learning on a drum pad. Timpani, mallets, and all percussion instruments taught. Gunner M. wonders, "Should I finish my summer reading, or go to band camp?" Steve R, from Bryn Mawr, goes to Radnor High School. Austin H, from Bryn Mawr, goes to Episcopal Academy. Grant M, from Haverford, goes to Friends Central. 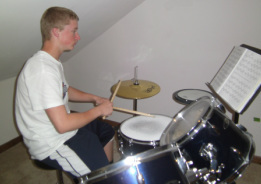 Zach B, from Penn Valley, has been taking drum lessons from Mr H since pre-school. Zach B, from Penn Valley, is still rocking! Ryan B, from Narberth, has graduated to Lower Merion HS. He still feels the beat! 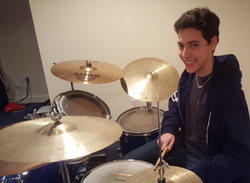 Max G, from Bala Cynwyd, is a 9th grader at Lower Merion High School now, but is still a drum student with H Factor. Jake S, from Bala Cynwyd, goes to Lower Merion High School: Mr. H is a fun, cool, and excellent teacher. Kyle H, from West Chester, goes to Episcopal Academy. Alex B, from Haverford, goes to Harriton High School. 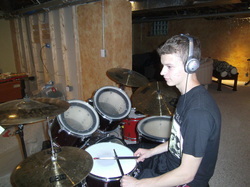 Gunnar M, from Media, goes to Penncrest, competes in Drumline. Scott K, from Havertown, goes to Haverford Middle School. Nick T, from Villanova, goes to Harriton High School. Max and Linus R, from Merion Station, go to Merion Elementary. Tom H, from Wynnewood, goes to Lower Merion High School. Lucas C, from Bryn Mawr, goes to Episcopal Academy. He's a beginner with H Factor. Luke H, from Villanova, goes to Ithan Elementary. Andre H, from Chadds Ford is still in preschool - but he's not too young to "feel the beat"
Nick S, from Wayne, is a 5th grader at Valley Forge Middle School. Matt, Katie, and Jack P, from Bryn Mawr, are in 2nd, 8th and 9th grade at the Shipley School. Richard H, from Penn Wynne. 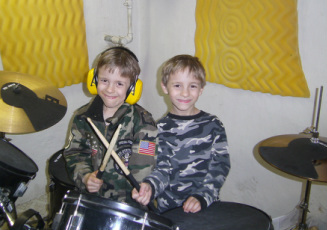 H Factor Percussion is the first choice for drum lessons on the Main Line for kids AND adults. Jullian P, a 9th grader from Lower Merion wasn't slowed down by a sprained hand! Jullian P, is in 10th grade at Lower Merion High School, now. Quinn D is a 7th grader at the Haverford School. Gemma and Marcus C, from Bryn Mawr are in Kindergarten and second grade at Friends Central. Jonah R is an 8th grader at Welsh Valley MS, now, and still going strong. Max S is one of our high school students. He is a junior at Harriton. Theo Y from Wynnewood is in 5th grade. He's rocking the H Factor T! Theo Y has come a long way. He's a real rocker now! 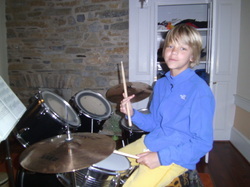 Louis R is taking drum lessons at his home in Wynnewood. We love to see that H factor gear on our guys! Joaquin A, one year later - in the fifth grade at Coopertown Elementary. This kid keeps getting better and better! Cyrus B has upgraded to a whole drum kit. This kid is really feeling the beat, now! Caleb C, from Berwyn is a first grader at Beaumont Elementary. Skylar G, from Chatham Park Elementary is in second grade now, but will soon be rocking the house! Skylar G is getting good. You should hear this kid! Arjay M, from Narberth is a second grader at Merion Elementary - but he sure looks too cool for school. Sam M, from Penn Wynne is a kindergartener who's getting an early start on disturbing the neighbors! 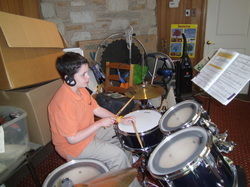 John B, from Narberth, is a 7th grader at Bala Cynwyd Middle School, just getting started with drums. H Factor will have him feeling the beat in no time! Johnny B, from Narberth is getting better and better at feeling the beat! Meg L and Grace L, from Waldron Mercy Academy are sixth and third grade sisters who just started drum lesson with H Factor Percussion. Mr. H will have them "feeling the beat" in no time! Gabe T, from Penn Valley got to see Mr. H play at the Robin Hood performance. 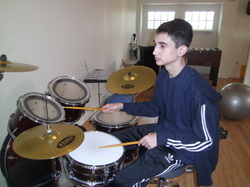 Gabe T, from Penn Valley just got upgraded to his first drum kit. Look out Mom and Dad - this house will be rocking! 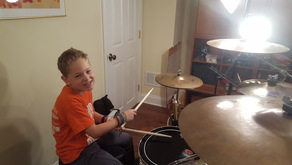 Luke P, from Newtown Square, is taking that big leap from drum pad to a full drum kit. 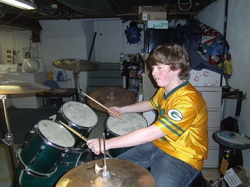 This kid could be the next great H Factor drummer! Daniel F, from St. Margaret's Elementary School in Narberth won a gift certificate for being "Student of the Week"
Michael and Fran R, from Newtown Square are a mother and son H Factor student duo! Mike is a 2nd grader at Episcopal Academy. 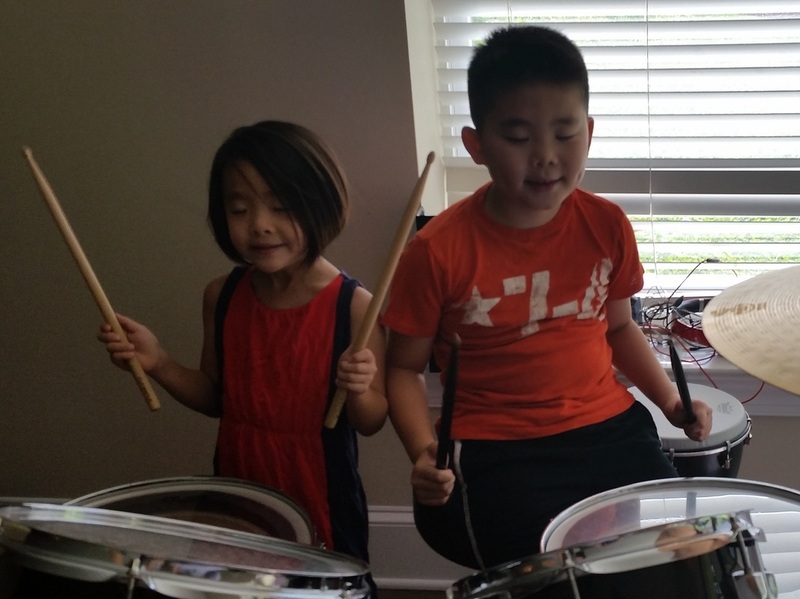 Ashley L, a 3rd grader at Ithan Elementary, has a bright drumming future ahead! Ashley L, is in the 4th grade at Ithan now. This is her new drum kit! 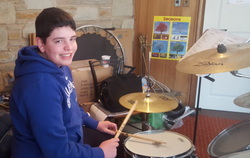 Scott K, a 9th grader at Haverford HS is an H factor drum student that knows his way around a drum kit! 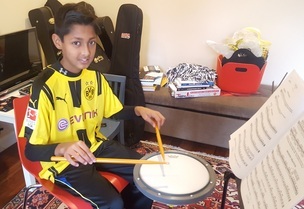 Raphael S. a 7th grader at Welsh Valley Middle School has been going great taking drum lessons from Mr. H.
Lucas C, a 2nd grader at Friends Central will be entertaining the rest of his class in no time. Thiago L, from Havertown, is a second grader who just started with H Factor this summer. Adeline D, from Havertown, is a 3rd grader at Chestnutwold Elementary. She's starting on a drum pad - but maybe not for long! Fred S is a 9th Grader at Harriton High School. He's a new H Factor student, and we can't wait to see how far he goes! Kadan O is a Kindergarten student at Ithan Elementary. Like most new H Factor students, he is starting on the drum pad. Nate is eight years-old, and in second grade. 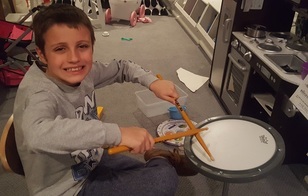 He will learn the rudiments on the drum pad, and then who knows how far he will go! 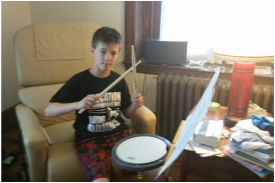 Preston B, a 7th grader at Radnor Middle School, is the next drum student to join the H Factor ranks. Eitan p, a 3rd grader at Torah Academy, just started with H Factor. That's the smile of a boy who's inner drummer was just unleashed! 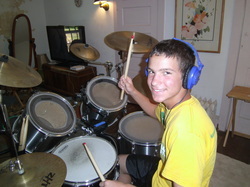 Adam G, from Penn Valley feeling the beat at the end-of-summer concert at music camp. Zach Z, from Berwyn, jamming with friends to "Paradise", by Cold Play. Another talent show on the Main Line . . . another H Factor drummer!